So, I wanted to see how far I could get with installing something which is a tad obscure onto an otherwise Linux only VM host. 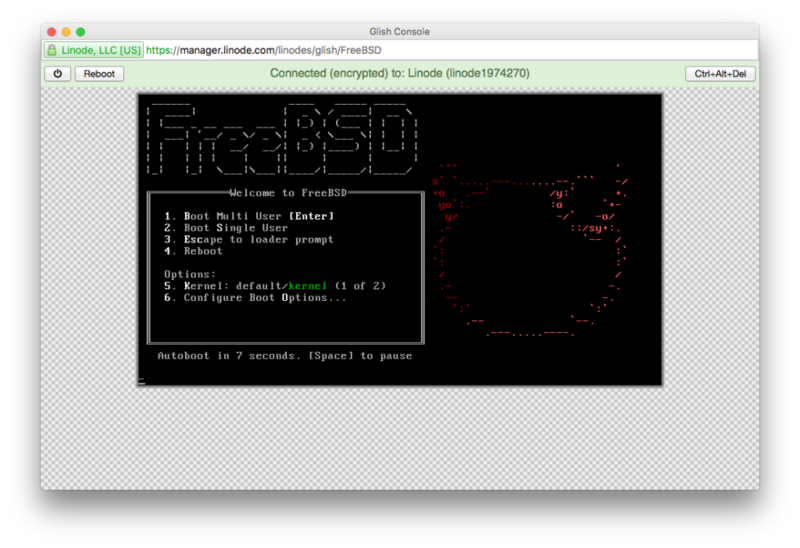 So, why not use FreeBSD? My goal here was to deploy a FreeBSD server to Linode (aka Linux Node IIRC) and see if it could boot, if I could get SSH access to more verify if I can actually use it as a viable VM. Now, I have been a long-term customer of Linode and also have a few servers with them – if you’d like to try them out then use this link to signup, it’ll help me out! Anyway, essentially I followed this guide on Linode Guides, but it mentioned Linux? What if I don’t want Linux? Windows? Well, Windows is boring and not as entertaining to set up. So, I am sitting here thinking “hmm, there is nothing on Netflix I want to watch, I have a little bit of a hunger and maybe, I want to do something a little strange” like the person I am. So essentially, I wanted to play around with FreeBSD except running it in Virtualbox isn’t as fun… I wanted to remotely install it (or in this case boot it) somewhere where it wasn’t supposed to be installed. 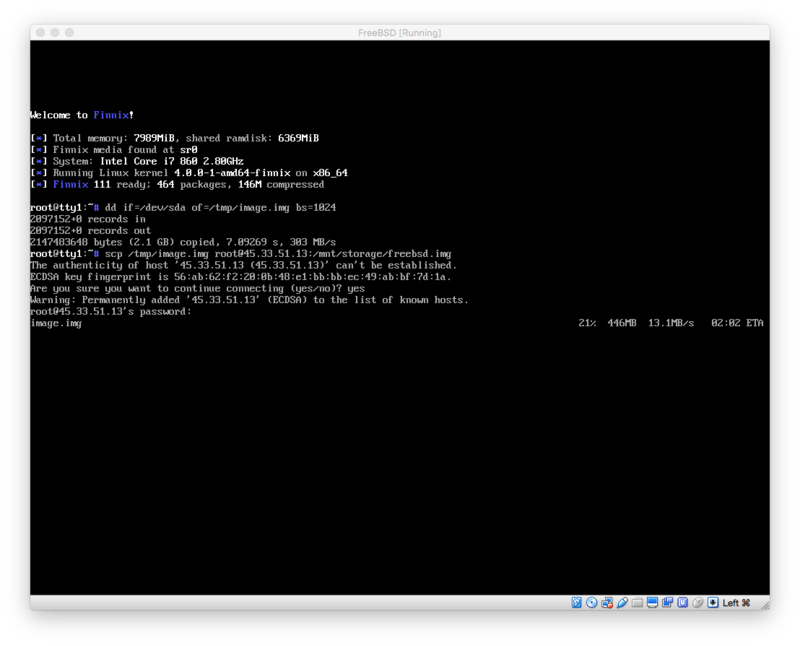 Sure, I could go with a FreeBSD VPS provider but again it takes away the fun of setting up a complete system yourself. 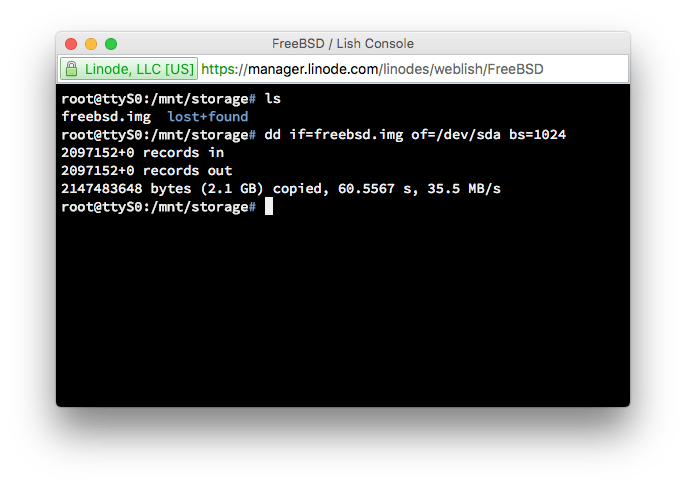 So, I’ve got a few VPS servers with Linode and thought there really isn’t any reason why it couldn’t boot… Assuming I boot it up into a recovery distro and just DD the drive with my FreeBSD image.. Right? Well, we’ll see. I thought I’d write this as I am doing the installation process for teh lulz. So, since I have a pretty-quick 200/200Mbit UFB connection provided by the ever-awesome folks at BigPipe I should be able to do this before I get to bed (here is hoping) so lets start by grabbing the FreeBSD ISO and installing this sucker on a VM. I am using in this configuration a VM with 1gb of ram, and a single processor hoping to match the $10US plan that Linode have as close as possible. The annoying thing though is because I crave the latest and greatest my FreeBSD download is running at around 10Mbit (boooo!) because I have to use their US servers and I am based out in the middle of New Zealand (literally… Well, close enough). 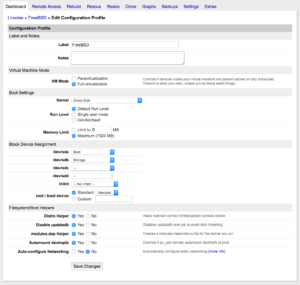 I really have no need for another virtual machine as I am sitting on plenty due to running a home OpenVZ server (soon to be upgraded with Linux Containers because OpenVZ is very last century) so this is literally going to be a task to create a FreeBSD machine, set it up with basic SSH access and firewalling, move it to Linode and hopefully boot it. So, it worked… Now, let’s SSH into this sucker. I literally can’t even… I think it is time for bed. This was easier than I thought (everything, including IPv6 networking is working out of the box). 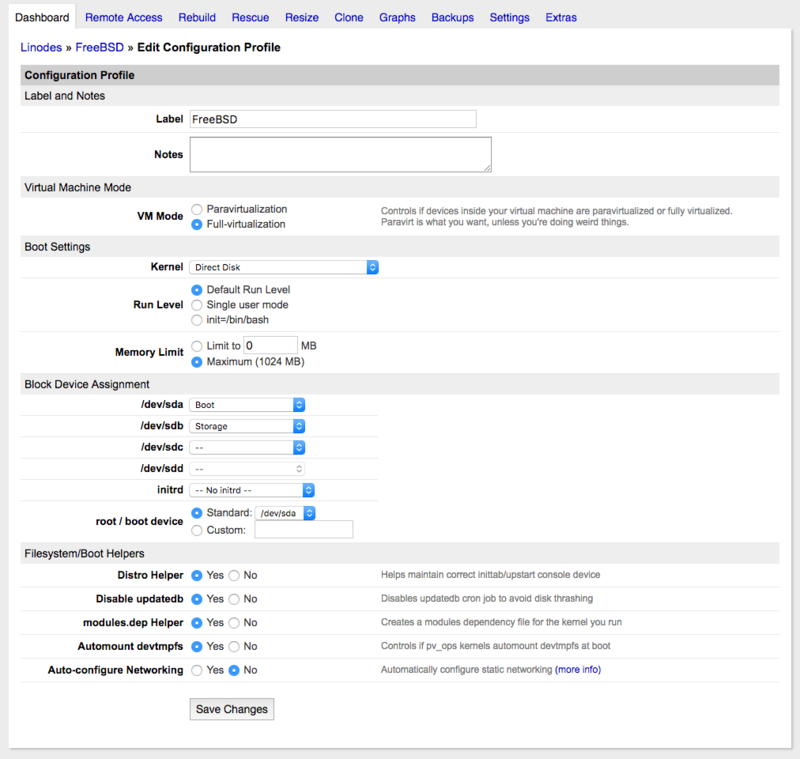 Now, I did install Hiawatha + WordPress on this VM to test performance and it was surprisingly quick so it is a somewhat viable solution if you’re wanting FreeBSD in the cloud, or to run a FreeBSD Firewall like PFSense in front of your Linode hosts (maybe for a private cloud situation). Thanks Linode for making an excellent solution! 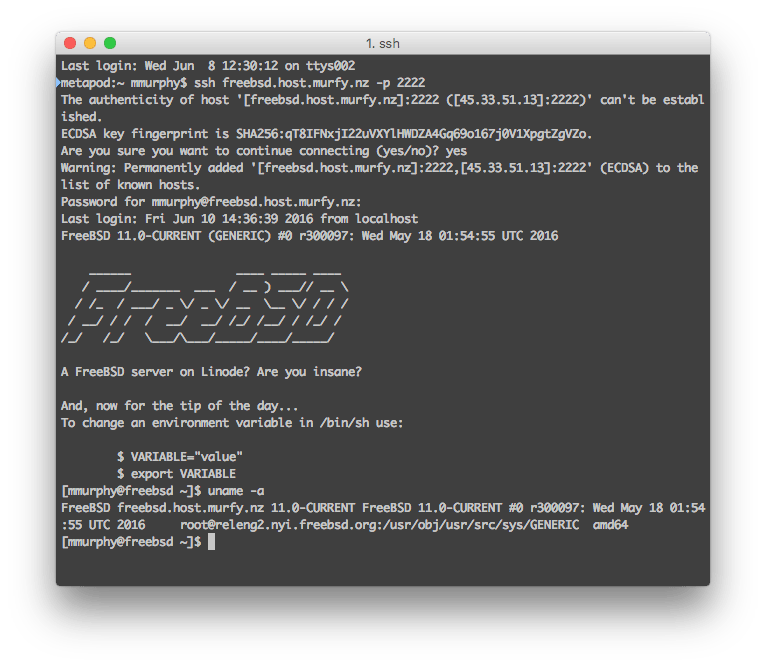 Edit after the fact: I just found this guide on Linode Guides that has another way to install FreeBSD on a Linode. I more wanted to experiment with creating a whole disk image and uploading it for an operating system that doesn’t have a standard Linux partition and is pre-configured (as in this case where I pre-configured a FreeBSD machine and uploaded it + booted it in the cloud).